Toenail fungus has the power to destroy your feet’s appearance and your confidence of ever walking barefoot in front of people. This medical condition starts through a gradual thinning of the nail bed and continues with the discoloration and flaking of the nail. In time, even the surrounding skin changes color and texture as your immune system loses the battle with the fungi. This rule is difficult to follow in the hot summer days. However, you can quickly get onychomycosis when you walk barefoot at the local bathhouse, around public swimming pools, and at the gym. These heavily-used floors carry a lot of bacteria and fungi that eagerly wait to infiltrate your skin and destroy your nails. An excellent preventive method against toenail fungus is to avoid as much as you can to walking barefoot in public areas. 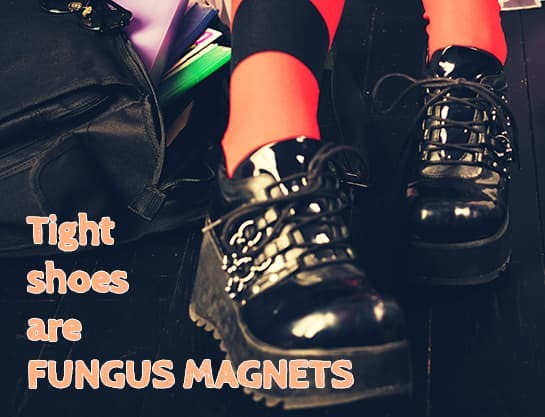 If you usually share shoes or socks with someone, there is a higher chance of getting toenail fungus. The other person may carry the fungi in its dormant form, and it can easily transfer to your feet. In time, a fungal infection could make your toenails flaky, thinning and discolored. In extreme cases, this condition can lead to the complete falling off of your nails. Grooming your toenails is crucial if you want to look good in your new cutout sandals. However, if you fail to disinfect your pedicure tools after using them, you increase the risk of bacteria building upon them. In time, these damaging microorganisms can penetrate your skin and nail bed and cause severe infections. Try to keep the pedicure tools clean at all times, and avoid visiting beauty parlors that pay little care for these beautifying instruments. Sometimes you like a pair of shoes so much that you would be willing to wear it in a smaller size if that is the only one available. However, using tight shoes can cause bruises and damage to the nail bed and the surrounding skin. These small lesions create the perfect gateway for fungi to enter and settle in. Even if you avoid being barefoot in public areas, you can still create the ideal environment for a fungal infection with your overly-tight shoes. Another practical advice that will help you stay clear of onychomycosis is changing tour socks every day. A fresh pair of anklets every 24 hours ensures that your skin is not affected by humidity or dirt. Furthermore, the nails get to be exposed to new textile material that does not allow for fungi to build up. Besides wearing new socks every day and slipping into comfortable shoes at all times, you also need to wash your feet thoroughly on a regular basis. Use specific bath products for your feet, and make sure that you dry your toes completely every time you get out of the shower. Extensive care will help you keep your feet safe from fungal infections. What if it’s too late to prevent toenail fungus? Sometimes, even if you are extremely careful with how you treat your feet and toenails, you still develop onychomycosis. In case all the preventive measures have failed, you can even reduce the symptoms and adverse side effects of toenail fungus. Your best choice of restoring your nails to full health is using ZetaClear – a potent formula of herbal extracts and antiseptic compounds that alleviates onychomycosis and should diminish the infection in just a few weeks. This anti-fungal solution uses only natural ingredients to help you relieve toenail fungus and regain your skin’s original complexion. Regular use of over-the-counter, all-natural solutions can diminish the damage produced by toenail fungus and increase your immunity against future onychomycosis outbreaks.